What Are the Uses of Ondem Syrup? 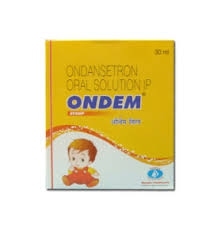 Ondem syrup is a commonly used remedy for children that contains the active ingredient ondansetron. Ondansetron may be prescribed for both adults and children as an intravenous drug, tablet, water-soluble film, or ondem syrup. Here, we will concentrate on ondem syrup for children – what it is, how it’s used, how much of it your child should take, and what are the possible side effects. Ondem syrup is a medication mostly used to treat nausea and vomiting. The syrup contains the active ingredient ondansetron, which acts as an antiemetic (anti-vomiting) agent by blocking the serotonin 5-HT3 receptor. Please note that it has no effect on fever or cough. Drugs containing ondansetron prevent the nausea and vomiting associated with cancer treatments such as chemotherapy and radiotherapy. It can also alleviate post-surgical nausea and vomiting, cyclic vomiting syndrome, and vomiting from dehydration and gastroenteritis. However, it does not affect motion sickness. For children between 4 to 11, the dosage is 4 mg thrice a day. For younger kids the dosage usually depends on body weight and it’s usually taken at 8 hour intervals. Consult with your doctor to make sure it's safe to use and how much should be taken. Ondem syrup can be ingested either with or without food. With any liquid medication, make sure you carefully measure the correct dose with a special dose-measuring spoon or cup. These can be easily provided by your pharmacist. Keep the syrup out of reach of your children and any animals, and away from heat, light, and moisture. If you forget to give your child a dose of ondem syrup, give it to him or her as soon as you remember. However, if it is almost time for the next dose, skip the missed dose; don’t give any extra medicine. If your child overdoses on ondansetron, get medical help immediately. Symptoms of overdose include light-headedness and loss of consciousness, rapid vision loss, and severe constipation. Ondem is generally well-tolerated with few adverse effects. However, patients can experience headaches, dizziness, fatigue, hiccups, flushing, and constipation. Children should not take ondem syrup if they are allergic to ondansetron or similar medications, such as palonosetron (Aloxi), dolasetron (Anzemet), or granisetron (Kytril). Patients who are aged 1-4 months should be very closely monitored if they are receiving ondem syrup, as it takes over double the amount of time for the drug to clear from their system, so the child may be more susceptible to adverse effects. Do not give your child any drug containing ondansetron if he or she is currently taking apomorphine (sold as Apokyn), as the ondansetron can further increase the hypotension from the apomorphine and may cause loss of consciousness. If your child has liver disease, you should also be very careful before giving him or her ondem syrup. This is because the drug takes two to three times as long to be cleared from the body as compared with healthy patients. Ondansetron has also been associated with a condition known as long QT syndrome, which can cause the heart to develop the potentially lethal rhythm termed torsades de pointes. The chances of getting long QT syndrome are greater if you have congestive heart failure or bradyarrhythmia, or are taking other drugs known to lengthen the QT interval, such as antiarrhymic drugs. Check with your doctor before your child takes ondem syrup if they have been diagnosed with congenital long QT syndrome or if you have a family history of this disease. Server responsed at: 04/22/2019 4:19 p.m.